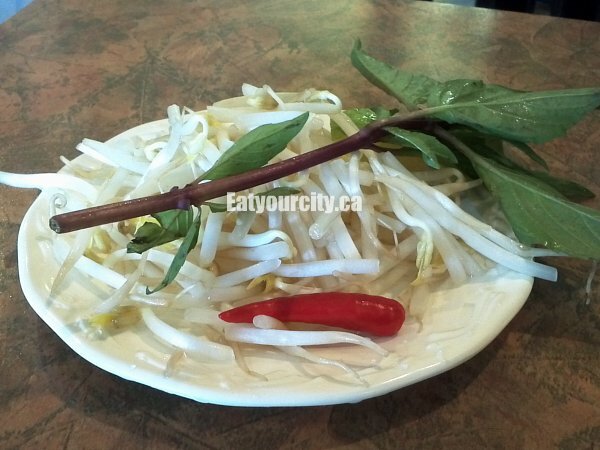 Eat Your City: Tau Bay Restaurant Edmonton, AB - Best pho or Vietnamese beef noodle soup in Edmonton! 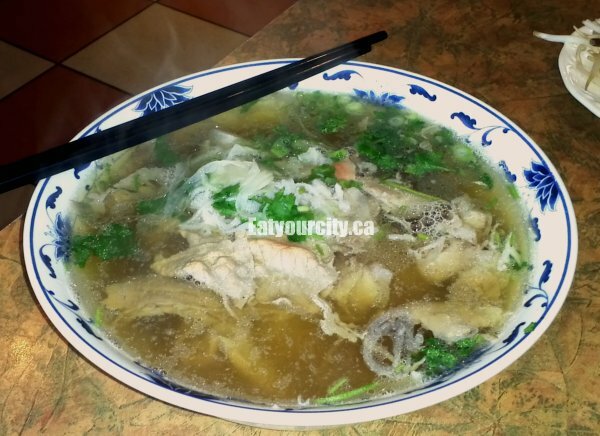 Still one of the best places in Edmonton to grab a hot, comforting bowl of Pho (pronounced "fff-uh" not "foe"!) - traditional beef noodle soup topped with shaved steak, slices of tender beef flank, bouncy meatballs, crunchy crisp bean spouts all floating in a savory anise flavored beef broth. The catch? You can get a bowl of this wonderful stuff... when they're open. Being they're so popular they can afford to be only open about 3-4 months cumulatively out of the entire year... that they have a fan based website devoted to whether they're open at istaubayopen.com so foodies craving the Vietnamese version of soul food can check ahead without being faced with the disappointment of a closed restaurant and empty rumbly tummy. Service is prompt and courteous with the waitstaff scurrying between old tables and wooden chairs. Decor is minimal, a Vietnamese painting here and there - the focus is definitely the pho here. So much so, that if you ask for take out, all the ingredients are separated and you'll get a lesson into how to put it together so the pho will taste right. The original Pho has a generous bundle of perfectly cooked thin flat rice vermicelli noodles and is topped with slices of fatty meat, slices of well done brisket, 2 pieces of beef tendon, some crunchy chopped up tendrils of beef tripe and crowned with some rare slices of steak, shaved onions, chopped cilantro , and green onions all bobbing in a fragrant beef based broth. 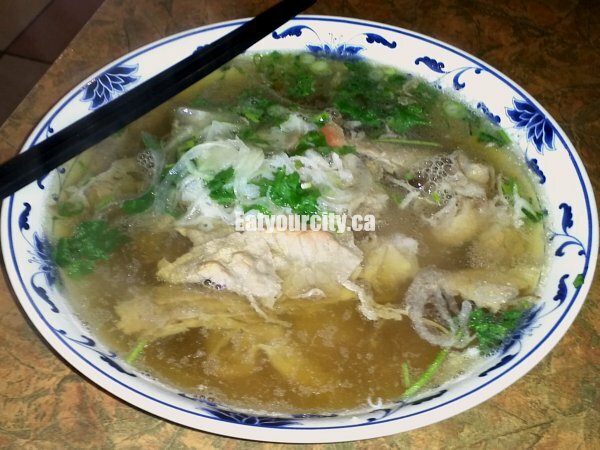 There are a few variations which are merely a few of the ingredients removed from the original #1 Pho - If ingredients such as beef tripe, beef tendon and fatty flank make you queasy, rest assured, there's a version in there where it won't grace your bowl. Don't spend too much time adding the "toppers" to your bowl or your noodles will get fat and mooshy as they will absorb the hot broth like a sponge. Jackfruit shake. 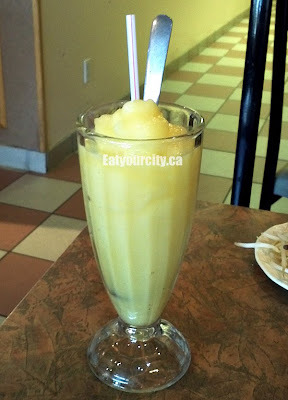 Exotic and yummy flavor - cross between a tart pineapple and guava, it has a mild unique scent that sometimes puts off people who have never tried it... its blended frozen with some ice and simple syrup - works beautifully to cool down your mouth when you dunked a bite of noodle into a bit too much of spiciness.